Every equestrian takes great pride in caring for and riding their horses. For many, their horses are their passion and they aspire to provide the optimal environment for them. When it comes to riding, the outdoors is a dangerous place for you and your horse. Outdoor surfaces are unpredictable, have an inconsistent grade and can be very slippery. The last thing any horse lover would want is for it to slip on a wet or inconsistent surface and become injured, or even worse, become injured yourself. The best solution for safe and convenient riding is through the construction of your very own indoor riding arena. Below are a few pointers on designing and building one of your very own. First and foremost, you want to build on high ground so that rainwater flows downhill away from your arena, and not downhill into your arena. Once you have found the right location, you will want to cover the ground of your indoor riding arena with 6 inches of pit gravel to obtain a firm subfloor for optimal riding support. On top of this should be either Sand, Limestone or Clay (depending on your riding preference). The amount of surface material should not exceed 4 inches, as too much sediment will not cushion a horse’s landing and can cause harm to tendons and other soft tissue in the legs. Whichever you choose, the grading should be at a 1% slope downward from the center to achieve optimal drainage for water that does penetrate your indoor riding arena. You need to take drainage into serious consideration, the last thing you want is a mud filled arena and a completely ruined riding surface. The structure itself can be any size you want but generally anything over 60 feet wide should be made of steel. 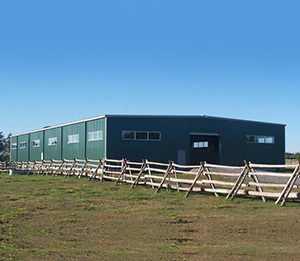 Smaller riding arenas can be built using a wood frame, but anything of optimal riding size will need to be of steel construction to support its wide roof. The length of your indoor riding arena should be at least 60 feet, but in most cases it is usually double the width of the arena. You want to have enough space to set up sufficient jumps, and have enough room to have multiple people riding at the same time without being cramped. As well, you are going to want to have a sliding door that is large enough to allow a horse to easily enter or exit your indoor arena. You should also have sufficient windows surrounding the arena to allow natural lighting inside, while also creating a connection to the outdoors. Aside from having the proper riding surface built with a proper sand and gravel base, the interior needs to be built in such a way that optimizes use for your indoor riding arena. Make sure there is proper ventilation to keep the air fresh and clean for you and your horse, and to keep the arena stink free (as much as possible). Pad the bottom of the walls with a sheet of plywood to form as a kickboard to keep the horses from hitting their hoofs off the steel wall beams. As well, make sure to have sufficient lighting so that you can ride day and night. Why not make your riding arena as functional as possible? Consider adding a transportation bay to load or unload your horses to and from the arena. Trailers can park up in a covered enclosure and easily transport horses in and out of the building. Add stables on one side of the arena to house your horses. Simply walk with your horse from one side of the building to the other when ready to ride! Finally, consider adding a viewing area for your friends, family and fellow equestrians to watch riders train and compete with their horse! Building an indoor riding arena can be quite the undertaking, but is very rewarding. One thing is for certain, steel is the most effective and safest way to build your arena. Contact Toro Steel today to start planning your indoor riding arena, and achieve the optimal space for you and your horses!